Website Hosting is simply a very powerful computer that is owned and managed by a Website Hosting Company like Siteground (Affiliate Link). You will be sending your website to this powerful computer so your customers can view it any time of night or day. In theory, you could host your own website on your own computer but your computer would always need to be on, always connected to the internet and capable of managing heavy traffic. You would also need a lot of technical knowledge to maintain it. This is why hosting companies like Siteground (Affiliate Link) provide dedicated website hosting services. Your domain name is your website’s address – it is what you type into your browser like Chrome to access a website. Our domain name is www.pagepixie.com. Every Domain name is stored in the Domain Name Server (aka DNS) – this is like a giant Phone or Address book. When someone types your domain name into their browser (for example, Chrome) it goes to the DNS which then looks up where you have stored your website, so they can browse it. Choosing your domain name can be tricky business, so if you are not sure of what domain to use just yet – check out the lesson: Naming Your Business, in the Planning Your Website course. Every website needs hosting. If you have been using a solution, like Wix, Squarespace or WordPress.com, then the hosting was being provided by that company, as they were hoping you would upgrade to their paid packages. 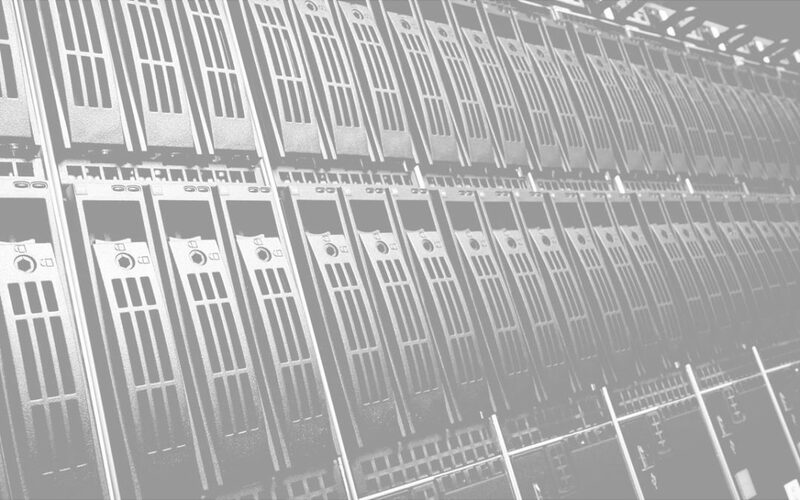 Your hosting is the foundation of your website, so I highly recommend taking out reliable, quality hosting with a provider who provides excellent customer service. Responsive, 24/7 live chat will save you hours of frustration and it is like having a technical team member in your business. 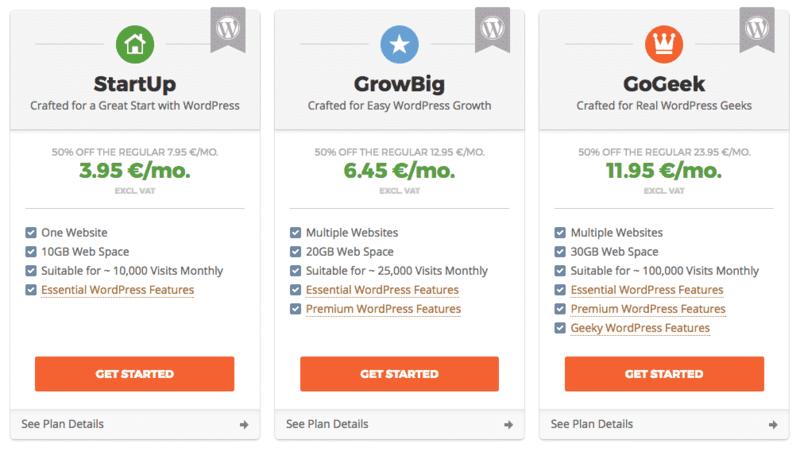 I have been using Siteground (Affiliate Link) for for both myself and my clients for years and can’t recommend them highly enough. Almost instant 24/7 live chat & support and also instant phone support – invaluable when you manage your own website. Fast Reliable hosting – speed is so important for SEO. And lastly they provide free SSL security certificates, which are now necessary for pretty much all websites. This reduces your cost even further as other hosting providers often change a premium for these per website. Having spent hours on the phone waiting for other hosting companies, I can tell you reason number 2 is enough for me to recommend Siteground. If your site is down on a Friday evening or over Christmas, the last thing you want to be doing is waiting until Monday morning or the New Year when your hosting company is open again to get back online. We have been using Siteground for years and recommend them to all of our clients. Please use this link when you are signing up for Siteground – https://siteground.com/go/onpres – we earn a commission for any referrals, which is how we keep this course free and up to date, but we genuinely wouldn’t recommend it if we didn’t love and use it ourselves. The Start Up plan is for people with one website that are just starting out and want to keep the cost low. The Grow Big plan is the package I recommend – it allows you to have multiple websites and includes 30 days of backups which is invaluable if you are ever hacked or simply make a mess of your website – just roll back to yesterday in less than 5 minutes! The Go Geek plan is more suitable for more experienced developers or those with large websites as it includes more geeky development needs like staging and GIT integration. For most people the GrowBig plan will cover all of their needs. So click on the Get Started button to well… Get Started! I don’t know what domain name I want yet: I recommend waiting until you know what name you want – check out the Lesson: Naming your Business, in the Planning Your Website Course. I know what domain name I want and it is available but I have not registered it yet: Simply type in the domain name and choose the TLD or Top Level Domain suffix. This is usually .com but there is a list of other TLD’s that are available through Siteground for you to choose from.If you need a TLD that is not on the list – you may need to register the domain name separately with another registrar. An example of this is the Irish .ie domain name which is restricted to ensure anyone trading with it is Irish or has links to Ireland. For more information on restricted domains check out our post in the lesson notes. I have already registered my domain name elsewhere: Great – simply choose “I already have a Domain” and enter it. You will need to tell the DNS (that giant address book in the sky) that your website is located here at Siteground. Check out the notes for our guide to Understanding & Setting your Nameservers for a walk through of how to do this. 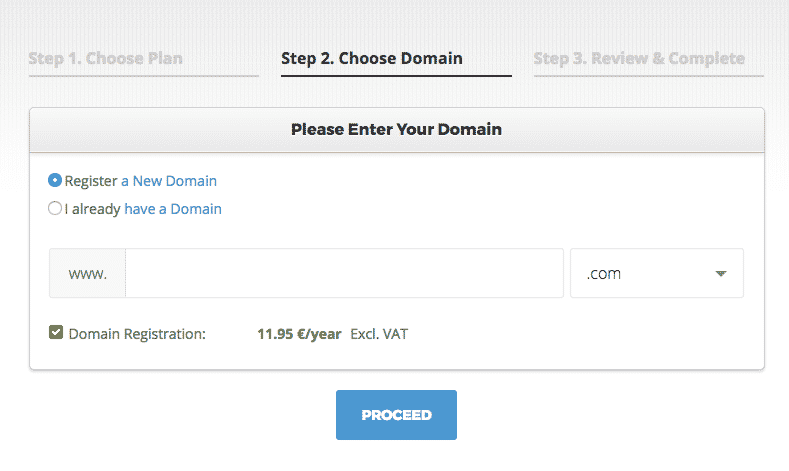 For now – just enter your domain name and click Proceed. Fill out your account and payment details. In this section you will need to choose the duration of your hosting. If you can take out the three years – I highly recommend it to lock in the introductory discount – otherwise you will be paying full price next year. I really wish someone had told me that when I set up my first hosting package! Extras: Check out the extras to see if you want to include them – I generally don’t unless they are free/included. As soon as you are ready, tick the box to confirm Terms of Service & click Pay Now. Follow any additional directions from Siteground to complete setup. When your account registration is complete you will get an Order Confirmation email with your Username that you will use along with the password you set up to login. Any time you want to login – simply go to https://siteground.com/login.htm or click the login button at the upper right hand corner of the homepage and enter your details to be brought to your account dashboard. Congratulations – you now have your domain name and hosting set up and ready to go!